Pablo Picasso created more schlocky crap than any artist in history. Picasso, however, was always at work. His life was a non-stop stream of artistic output. 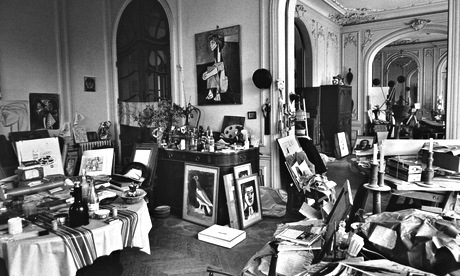 His home and studio were packed to the gils with his work. It was his manic output, it can be argued, that took him in directions no one imagined. Amidst the steady stream of creative work, a masterpiece would occasionally emerge that would forever change the direction of art and history. Most artists I know (whether it be visual artists, writers, musicians, craftsman, artisans, or playwrights) are afraid to do the work. Afraid of criticism, afraid of producing bad art, afraid of the voices in their head, afraid of revealing their heart, afraid of what the parents will say, afraid of being successful, afraid of being a failure, etc., etc., and etc. Several years ago I memorized the above verse from this morning’s chapter. One of the things that I love about God’s Message is that I will occasionally find layers of personal meaning unintended in the original context. David, the warrior, poet, and song writer, was encouraging his son Solomon, the young philosopher, poet, and song writer, to be diligent in accomplishing the work of building the temple. Solomon’s temple, built from his father’s inspiration, plans, blueprints, would become one of the seven wonders of the ancient world. Wow, Tom–beautiful words today, uplifting and greatly needed! Thank you! Thanks so much for the kind words. Based on a few comments I’ve gotten, I think this one landed for a few people. I’m always pleasantly grateful when that happens. Good word for me today, Tom! Thanks for doing great work! !